Debbie Richard grew up in Appalachia, in the hills of West Virginia. Born in Parkersburg, she spent her early childhood in the rural community of Munday in Wirt County, and lived near Walton in Roane County during her high school years. 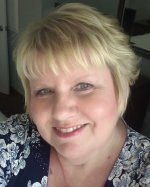 Debbie studied Secretarial Science at West Virginia Career College in Charleston where she completed her courses in 1987 with honors. She moved to the south as an adult, following her love of the ocean. She moved back to her home state of West Virginia in 2015. She is a member of South Carolina Writers Association and West Virginia Writers, Inc. Her poems have appeared in Torrid Literature Journal, Adelaide Literary Magazine, Scarlet Leaf Review, WestWard Quarterly, Halcyon Days, and others. She is the author of three books and an audiobook: Resiliency, a chapbook of poetry (Finishing Line Press, 2012); Hills of Home, a memoir about growing up in Appalachia (eLectio Publishing, May 2014); Hills of Home, Audiobook (Sweetsong Productions, October 2018); PIVOT, illustrated poetry (Adelaide Books, NY, January 2019).